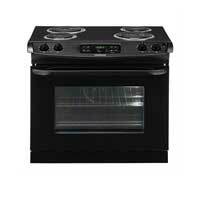 For your basic, well-performing electric range, you can’t go wrong with this Frigidaire model for $764. The digital controls and dials are arranged neatly along the front for easy access, and they include one-touch baking and cleaning options. For your peace of mind, this range has an automatic shut-off after 12 hours should you forget to turn it off yourself. For its relatively low price, this Frigidaire range still offers adequate oven space, a large viewing window, and effective coil elements for satisfactory heating performance.